Mr. Sage, a powerfully built man of the cloth, announced one Sabbath his intention to hold a meeting for catechizing the people in the house of a certain laird well-known for his evil living. When Mr. Sage arrived at the laird’s door, the latter asked why he came. Sage replied, ‘I come to discharge my duty to God, to your conscience and to my own’; which the laird met with, ‘I care nothing for any of the three; out of my house, or I’ll turn you out.’ The minister simply responded, ‘If you can.’ There followed a sort of catechism preparatory meeting with the laird, said to be a very powerful man. Yet when the interchange was over the laird was lying on the floor with a rope around his hands and feet. Since the laird ‘was now bound over to keep the peace,’ as Sage put it, the minister called in the people of the area and taught them the Shorter Catechism, no one—of course—refusing! 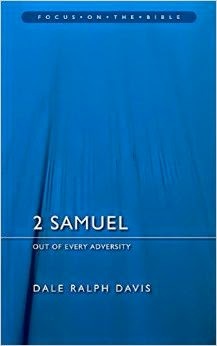 Davis proceeds to note that the Davidic covenant in 2 Samuel 7 has a bit of “that Aeneas Sage tone about bit.” He explains: “Yahweh’s kingdom plan is simply unstoppable; he will overwhelm death, sin, and time to bring it about. And he has” (p. 80).